We’d love your help. Let us know what’s wrong with this preview of Cultured Food in a Jar by Donna Schwenk. 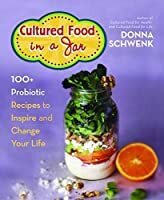 Published September 26th 2017 by Hay House, Inc.
To ask other readers questions about Cultured Food in a Jar, please sign up. My new favorite book this year! Chock-full of recipes for making different kefirs, fermented drinks like kombucha, vegetables, cereals, dips and SO much more. It's written in a way that's easy to understand with beautiful photography. The author also explains the importance of eating fermented foods including the benefits. The majority of this book is recipes! So far I've made the basic kefir, creamy kefir cucumber salad, and the peach smoothie. Delicious! Good book! Glad she has a blog since this was a library book and I had to return it. I am convinced I need more of this stuff in my diet.